More than two years after an east coast low savaged Wamberal Beach, the public has been given access to a consultant’s report that urged Central Coast Council, then under administration, to immediately remove inappropriate materials from the beach. The report, by Coastal Environment Pty Ltd, recommended that Council made approaches to State Government and emergency services directly, for assistance with funding and resources. “Foreign material introduced, whether from the collapse of building and landscaping from above or from exposure of buried posts, collapsed stairs, iron, tyres and glass from below, cannot only pose a risk to beach users immediately following the storm, but if not removed, can result in greater risk of injury in the future, when they are gradually exposed on the beach once again, or hidden just below the surface out of sight,” the report said. “The first step in rehabilitating the beach is to remove all material from the beach area, seaward of the scarp toe, that is inappropriate or may cause a danger,” it said. “This needs to be done prior to the sand building up on the beach as the beach berm recovers. “Such a cleanup also provides the opportunity to remove inappropriate or unapproved structures or protection works from the public beach area. The consultant recommended sand placement against the slope, through nourishment or beach scraping, as the best way to enable the safety and amenity of the beach to recover from the June, 2016, storm. The report said the volume of sand required to do the job properly was substantial, estimated in the report at 8,000 cubic metres or 800 truck loads. Coastal Environment Pty Ltd said that while the storm was significant, it was by no means extreme in impact along the Central Coast. “The measured waves’ heights achieved and the peak (King) tide water level were larger than normal, however, the recurrence period of both is less than a one in 10 year occurrence,” the report said. 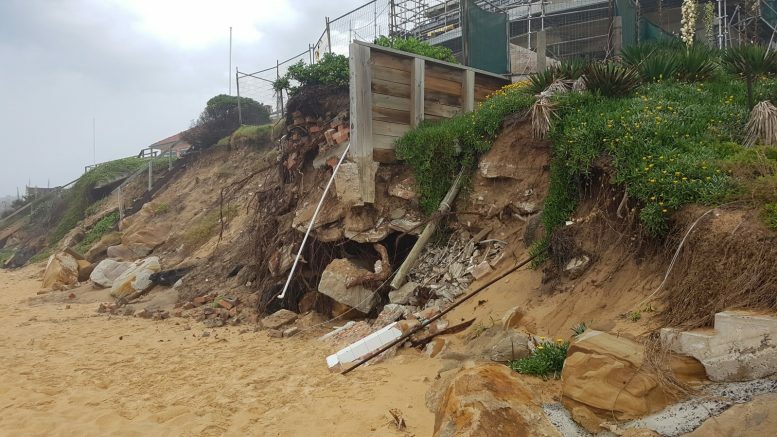 The erosion damage was focussed in the centre of the beach, between 21 Pacific St and north to 97 Ocean View Dve, affecting 40 properties along approximately 825 metres of the beach frontage. The purpose of the report was to “assist Council in addressing the orderly remediation of the beachfront and to prioritise those locations which pose an unacceptable risk to the public using the beach area”. It said the elimination of unacceptable public risk was its first priority. “The current instability of the beachfront poses an ongoing risk to persons and property and is susceptible to coming weather conditions prior to natural recovery or remediation work being undertaken”. The report also did individual assessments on over 50 properties that had been impacted by the storm, and identified 12 properties as having high risk issues arising from erosion of the escarpment, and identified as posing a high risk to public safety. While no dwellings were considered at immediate risk, many were located within an area defined as the immediate impact zone and “remain extremely vulnerable to further erosion or slumping of the erosion slope. 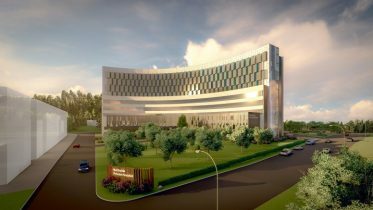 “We would recommend that for those 12 properties, a geotechnical and coastal engineering assessment should be undertaken prior to rubbish removal from the face of the slope or any slope stabilisation,” the report said. Five older residences on surface footings and in close proximity to an active escarpment were rated as at medium risk. A further 24 erosion scarps were classed as medium risk and requiring some rehabilitation. “Public safety is the immediate priority and a clean-up of the entire beach frontage is required to remove debris, inappropriate material and illegal or dangerous constructions from the public beach,” the report said. 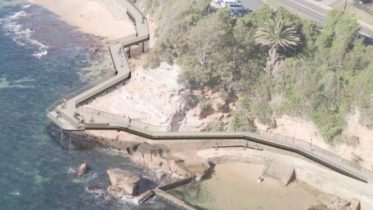 The report said erosion had removed the dune and beach berm along the centre section of the beach, exposed ad hoc protection works along the beach, much of which was placed during the 1970s, and reactivated the high erosion escarpment (up to 6m steep and unstable). The erosion event exposed old and inappropriate materials on the beach (and in the face of unstable slopes), the report said. “It has also added further debris to the beach as more recent works on private land and the public beach have failed. “Immediate response to reduce these risks is warranted. “This is an opportunity to remove inappropriate materials from the beach before they can be incorporated and buried during beach recovery. “This only raises the risk of them being exposed once more during future erosion events and they can pose an ongoing risk to beach users into the future. Materials identified in the report included loose rock, timber (some with protruding nails and bolts), broken glass and fittings, steel stakes and frameworks, exposed concrete, broken reinforced concrete with reinforcing protruding, and broken concrete stairways. 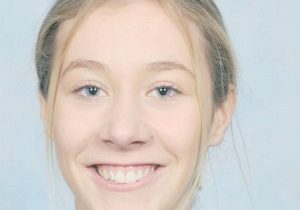 “There are also environmentally inappropriate materials exposed which should be removed as the opportunity is presented. “This includes small amounts of potentially asbestos based material. “The material observed is in very small quantities and is likely to be readily removed by hand “There is the possibility that larger pieces may exist within the unstable slopes or within the beach berm material. “Rubber tyres are also exposed as part of early protection works. The report said that irrespective of whether the materials were located on private land or the public beach “it poses an ongoing hazard and needs to be removed. “Much of this material is an ongoing risk to beach users and will most likely need to be addressed by property owners under direction from Council. “This includes failed fencing, accessways, lighting, electrical connections, garden lighting, decking, protection works including failed concrete retaining walls and large boulders, and undermined trees. The report recommended Council remove the seaward ends of paths built from private properties to access the beach. “The opportunity now exists for them to be removed and not replaced”. It said Council needed to identify the seaward property boundaries as a priority, to ensure it could require property owners to address issues on their properties. The preferred long term management strategy emanating from the Coastal Zone Management plan “should be pursued as a priority, as the risk to developments has not passed”, the report concluded.